These easy refrigerator Bread and Butter Pickles taste exactly like the ones my mom used to can. Except, these are no muss, no fuss!!! 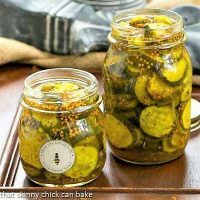 If you’re new to canning or don’t have all the proper equipment for the full fledged canning process, this simple recipe for homemade pickles is the perfect place to start! Each summer, we’d pile into our unairconditioned station wagon and take the eight-hour trek up to visit our North Dakota relatives. There were no seat belts or radio in that car, either. My dad was a frugal man! We’d kill time by picking out our favorite farm houses and playing license plate games as we headed north on I-35. Once our trip corresponded with a total eclipse of the sun, so we drove to the Canada border for an awesome show by Mother Nature. More typically, we’d create our own adventures with our cousins. We climbed into the barn lofts, visited the dogs and horses, ate homemade caramels and tacos and helped make bread and butter pickles. 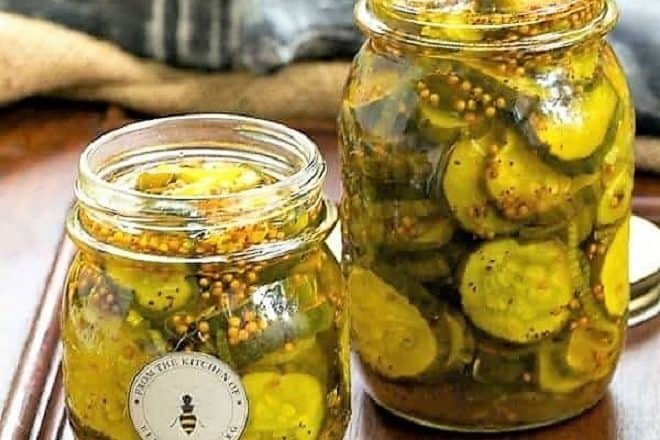 My dad was more of a dill and garlic sort of guy, but, like my mom and her clan, I loved these sweet, sliced pickles flavored with mustard and celery seeds. I’m certain my aunt, Angela, actually canned hers, but I took the easy route with these easy refrigerator bread and butter pickles. At that age, I was much more interested in eating them than paying attention to the process, but I’m delighted it was so easy to replicate the taste. If you’re lazy like me and don’t want to go through the full routine of actually canning pickles, this refrigerator pickle recipe is perfect for you! The process will still take a few hours, but it’s a very simple procedure. Happy preserving! Use the freshest, unblemished cucumbers you can find. Pickling cucumbers are smaller than the variety you may use in your salads, so look for those. Wash your cucumbers without soap before brining to remove any dirt or contaminants. To make these pickles, slices of cucumber and onions were heavily salted and covered with ice. Over three hours, the ice began to melt and the vegetables were brined. A double rinse is needed to remove excess salt and then, the cukes and onions were added to a hot pickling mixture of vinegar, sugar and spices. The ratio of vinegar and sugar can vary among recipes as well as the spices used. 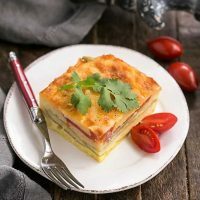 This recipe hits the mark of perfection for me! Feel free to tweak it to your taste buds. For example, these sweet pickles are pretty sweet, you may want to decrease the sugar, but I find these perfect! These bread and butter pickles were packed in jars and cooled before screwing on the lids and refrigerating. Now isn’t that simple? Since this method did not involve sterilization, they should be eaten within a couple weeks. If you grow pickle sized cucumbers in your garden, make an extra batch and share with your friends and neighbors! These refrigerator pickles are nothing more than a subclass of sweet pickles. The origin of their name may come from the Great Depression, when they were possibly used as a sandwich filling when combined with bread and butter. Note: I purchased my canning labels from Felix Doolittle. Watch for sales around the holidays. 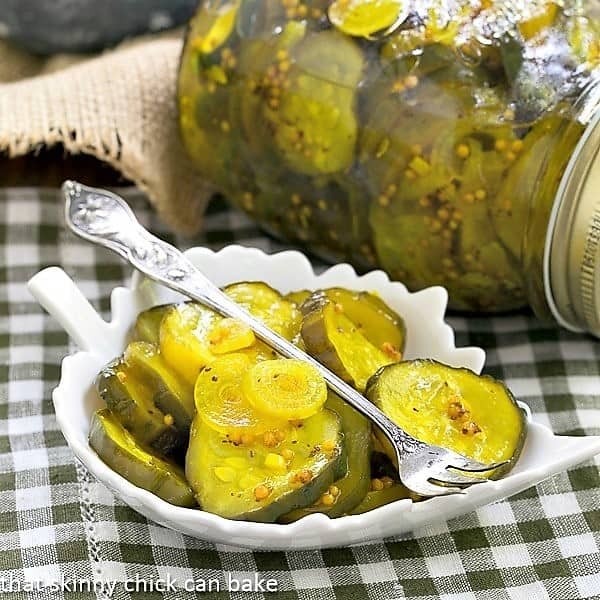 Easy, refrigerator bread and butter pickles like my mom used to make! In a large container, combine the cucumbers, onions and salt. Cover with crushed ice and mix well. Let stand for 3 hours. Drain; rinse and drain again. In a large pot, combine the sugar, vinegar, mustard seed, celery seed, turmeric, and cloves and bring to a boil. Add cucumber mixture, then return to a boil. Remove from the heat. Carefully ladle hot mixture into jars. 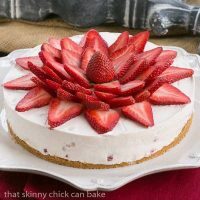 Let cool, then screw on lids and refrigerate for up to 2 weeks. If you’d like to store them longer, refer to a canning manual or website for directions. I’m offering a series of Skinny Tips. How I keep slim is one of my most frequent inquiries. I’ll feature tips on some of my upcoming blog posts. Tip #35: This tip is courtesy of my friend, Christy, from Confessions of a Culinary Diva. Shop the perimeter of the store. That’s where you’ll find the meat, produce, and dairy. 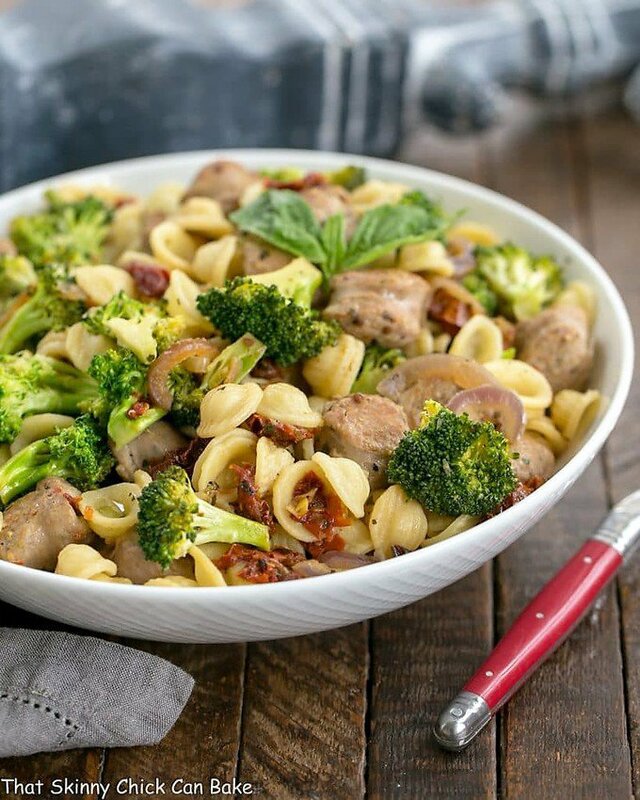 Avoid premade, packaged convenience foods in the center of the market, since they tend to be higher in calories and lower in nutrients. Thanks for the pickling tip! Your jars look ready for selling in batches! I have a vague recollection that my stepfather’s side of the family made bread and butter pickles when I was a child, Liz. But, like you, I never really paid attention to the process. I thought they started with pickles already and added spices and sugar. Guess I’ll have to ask my mother. Meanwhile, I’m going to make some of yours. 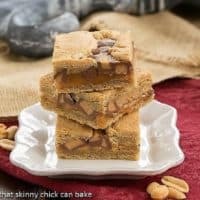 They look crunchy and delightful! Thanks for sharing! I always wondered what on earth bread and butter pickles were! I’m definitely trying this recipe Liz. My grandmother mad the best bread and butter pickles ever! They bring back memories too. Love the tip today. Love bread & butter pickles. 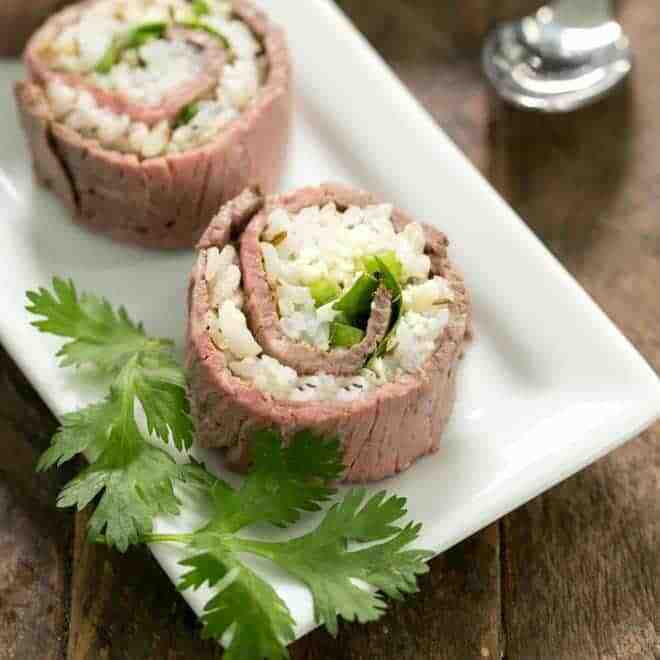 Have always made them by Aunt Joyce’s method, very similar in recipe & method. Just no cloves. Liz these look delicious! My husband would love it if I made homemade pickles for him. Wow I had no idea it could be this easy! thanks for sharing this Liz we’d eat them all in a few weeks for sure! Nice gifts too! Bread and butter pickles are some of my favorite things. I love the sweet and salty bite they have. I’ve actually been adding all sorts of pickles to savory entrees lately and have been loving the flavor! Your pickles look amazing and I’m in LOVE with your Made By Elizabeth sticker on the jar! I remember those cars long ago without seat belts. How did we ever survive? 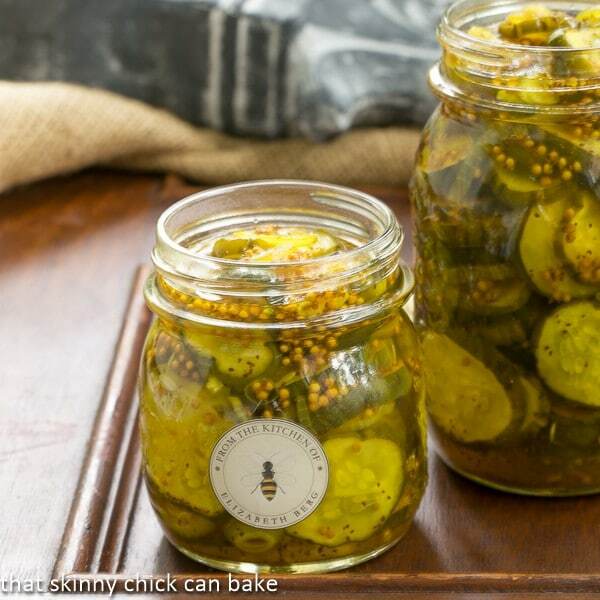 Thanks for sharing your easy pickles recipe. Nice to see another one that doesn’t require canning. Yum Liz! This is such a great idea! I have been wanting to make bread and butter pickles. Saving your recipe. I made bread and butter pickles for the first time last year at the request of a 88 year old neighbor. She would be delighted if I made them again for her. On a side note, I absolutely love your labels! Childhood memories….I’ve always been a pickle-a-holic, bread & butter, dill, you name it I eat it! I wish I had learned to can from my grandmothers, if I only knew then what I know now about how precious those memories would be later. Love, love, love these so much. I could just sit with a fork and the jar and eat to my hearts content!!! Love your little stickers too, reminded me I have some that I have never used!! These pickles just scream summer to me! They look delicious! Bread and Butter Pickles is one of my favorites! I’m making a big batch next week when we get back home for an event! Your road trips brought up memories for me. Every couple of years, when I was a kid, we drove from our Pennsylvania home to visit my parents families in Alabama. It was a long 2 – day trip and we filled the time playing license plate games too, and playing an alphabet game where we had to find things outside the car that started with a, then b, c, etc. We couldn’t use each other’s words, and couldn’t move onto the next letter until we found something noone else had used for the previous letter. I can still remember how pissed I was when my dad spied a quilt hanging in someone’s backyard in Tennessee right when he was looking for something starting with a ‘Q’. Mom and I tried to bribe him with cookies to allow us to all share quilt for our ‘Q’s. I’ve never made pickles before. So glad you went first and explained the process in such easy to follow terms. You made my favorite! BTW I love that sticker you have on the jars! That is sooo cute!! Gorgeous pickles, full of idyllic childhood memories – just perfect for a nostalgic summer snack! I always shop the perimeter of the store. Luckily yesterday I found Oreos on the perimeter 😉 Pickles have always been one of my favorite snacks. This is such an interesting method for making them. Love your idea of a fridge-version! Every year my family drove from So. Calif. to our family farm in Rogersville Mo. My dad was a non-stop driver so if you had to go to the bathroom you had to make a dash for the restroom at the gas station! When Dad was ready you had better be in the car. No stopping to see the sights (I was grown before I got a chance to see the Grand Canyon!) Half way there we would stop at a motel so that he could get a few hours of sleep. We would hang out at the pool (if there was one) and then start out again with Dad at the wheel. Whee! Look out! My parents are gone now but I remember what fun we had laughing and talking and singing on those LONG trips! We put a lot of miles on that station wagon! 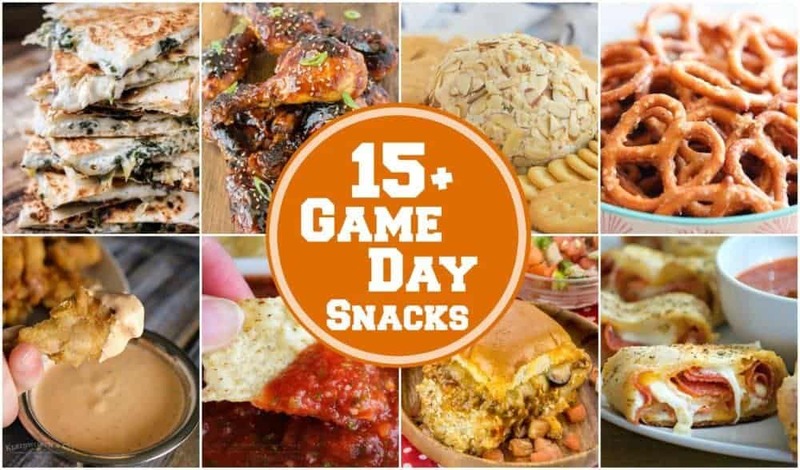 I love how quick and easy these are to put together they look and sound simply delicious. Nothing beats a treat that can take you back to your childhood! I’ve never canned pickles before Liz, so I’m saving your recipe for future summers. Bread and Butter pickles are my mother’s absolute favorite flavor too! Been canning tomatoes every other day and we’ve still got them coming on the vines . . . guess it makes up for not having even one tomato last year due to the torrential rains we had. Ah, Mother Nature! I so remember those kind of car trips. Sometimes I’d put my little sister on the floor in the back seat and make her up with my makeup. Then she’d raise her head and look at my mom in the rear view mirror. My mom would almost drive off the road 🙂 I could eat my weight in these pickles! Love them! Love bread and butter pickles! And yours look fabulously delicious! Love the label! While I’m not a fan of B&B pickles, I wouldn’t pass them up on a burger either! These are one of my favorite kinds of pickles! Thanks for the recipe Liz! I love pickles. Any kind of pickles. And these pickles? I want them! 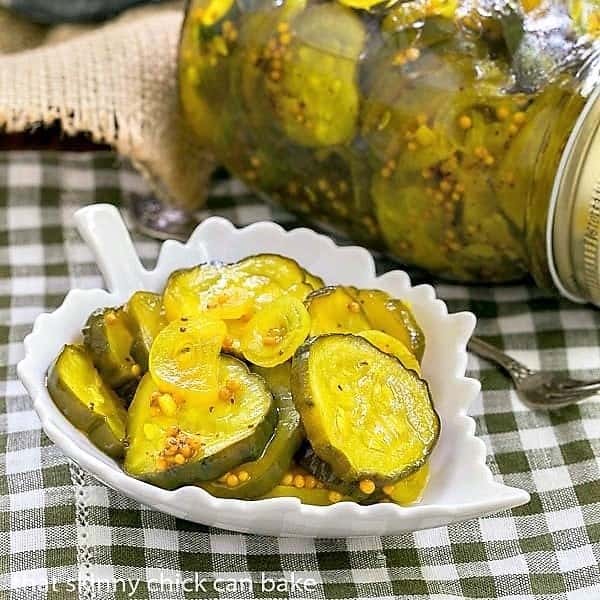 Looks like a fabulous pickle recipe, which I will be making soon … thanks for sharing! 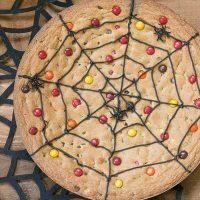 These look yummy Liz! I made some a couple of weeks ago they were fantastic. Made dill also but the bread and butter are my favorites. Your’s is the first bread and butter recipe I’ve seen that uses tumeric. Wish I had seen it, I have a ton of tumeric on hand. Guess I’ll have to make more! This year, we are on the search for the perfect bread and butter pickle recipe. I’m excited to give yours a try! those are the best memories aren’t they??? … bet you miss those summers, but not the lack of A/C! Have a great Friday Liz! I am a pickle nut!! My bf, not so much. So I rarely get to indulge. I would love some of your pickles right now!! My husband loves bread and butter pickles. I had no idea how easy it was to make! Just curious–it looks like there are coriander seeds in your pickles, but they are not listed in the recipe. Did they get left off? Those are the mustard seeds—they DO look similar, but no coriander in the recipe. Hope you enjoy! I love refrigerator pickles because they’re so easy to make and I am not the best canner. 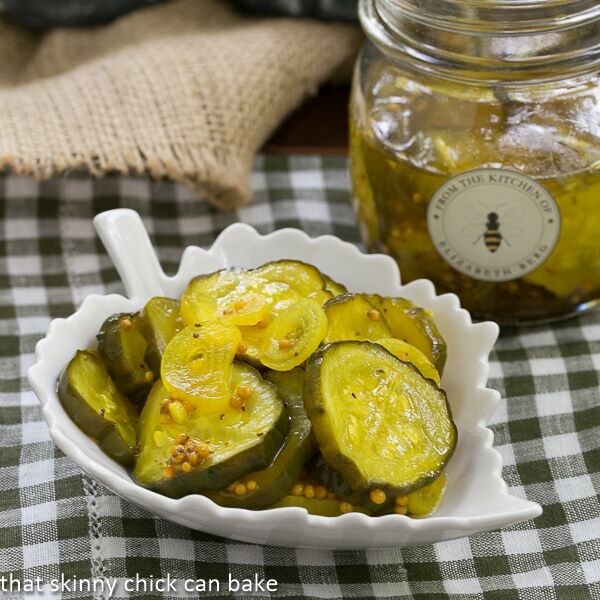 These bread and butter pickles are so yummy! Oooh I didn’t know pickles were so easy to make. I’d have these as the star of the show in a sandwich with just a little mayo and mustard. Yum!